We believe we have been created by an amazing, gracious, and loving Creator and set free to worship Him with excellence, passion, and creativity. We believe that creativity should be overflowing in our worship of the Creator, and worship that honors and glorifies Him should be at the heart of the arts. We want to use everything in our means, therefore, to worship our amazing God who has blessed us to “show theimmeasurable riches of His grace in kindness toward us in Christ Jesus.” By supporting artists of faith and incorporating the arts more fully into the life and worship of our community, we hope to connect people to the power and presence of Jesus Christ. If you have worshipped with City Church on a Sunday morning, you will have noticed an artist perched in the right balcony, painting away during the service. 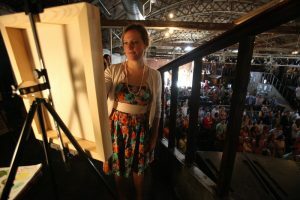 The Artist’s Loft is a component of the Worship Arts Ministry at City Church, and those who serve on team range from local professionals to hobby artists. The common thread is that every Sunday, the artist on schedule commits to pray for us as we gather. The drawing, collage, or painting that emerges throughout the morning is the fruit of that prayer – meant “for building up the body of Christ” (Ephesians 4). We encourage you to venture up to the loft after the service to see how the Lord may meet you through this ministry.